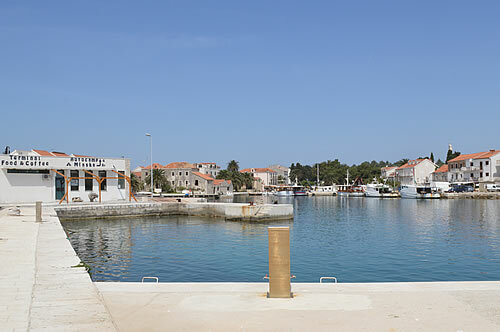 At the eastern tip of Hvar lies the pretty little port of Sućuraj. From there, it’s only 5 km, a short hop by ferry across to Drvenik on the mainland. From the island the effect is rather dramatic – you’re looking up at a 4,000 ft wall across the small channel, which looms ever larger as you sail across! 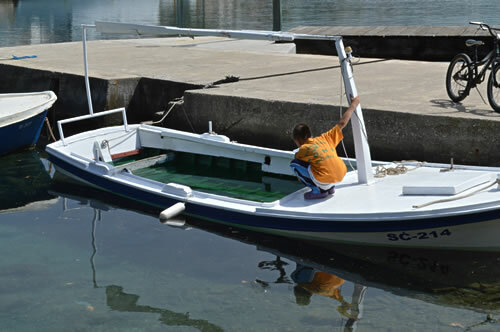 Sućuraj was my first ever point of entry to the island of Hvar. 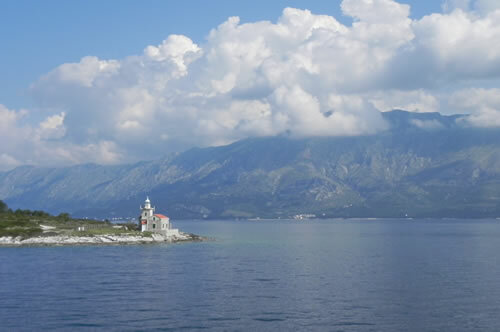 On that day, we’d driven across Brač in rain and fog (could hardly see the front of the car), caught the ferry to Makarska, driven down the coast road to Drvenik in wet, grey conditions, and were feeling pretty damp-spirited. Arriving in Sućuraj, we got ourselves a picnic lunch and sat watching the stunning view as the weather miraculously cleared and the sun came out! Over the intervening years, I’m afraid I’ve not learned much more about this small community that acts as a entry to the island for travellers, and an exit to the mainland for islanders. I usually only see it very briefly as we zip through at some speed because we’re late for the ferry again. You see, Sućuraj is about as far from other towns on the island as you can get, without setting sail. 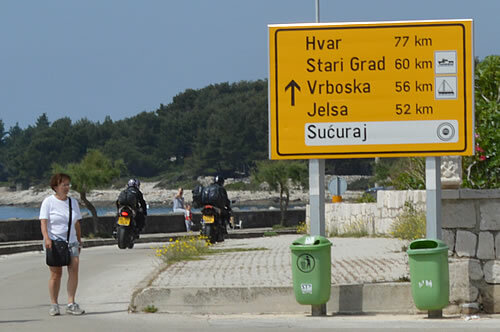 Sućuraj is 52 km from Jelsa, the next closest town, and 77 km from Hvar. Now that’s a pretty long drive, especially given the state of the road. And that’s before they started about 7 months ago to “improve” it (but I’m sure it’ll be just wonderful when it’s finished). So on our last expedition to Makarska, we decided to leave ourselves extra time for delays, and found ourselves in Sućuraj with the best part of an hour to kill before the ferry left. The ferry port is quite compact, with a tiny terminal building (cafe/bar closed for renovation) next to the ramp. The line at the ticket office wasn’t going anywhere for now, so we wandered off. 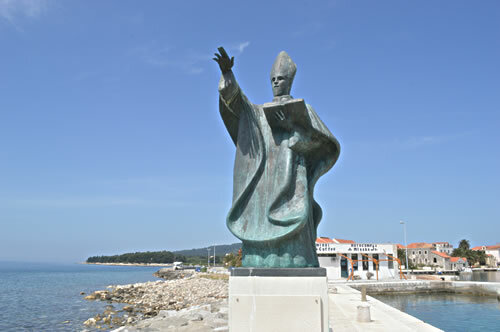 Looking out towards the mainland was an impressive statue of Sv Nikola with a seagull sitting on his conveniently outstretched hand. 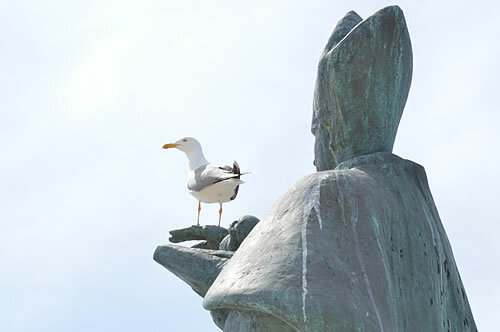 Sv Nikola statue from the front – sadly the seagull had left! He’s the patron saint of fishermen, but why was this not, we wondered, St George? Sućuraj is named after St George, that is Sveti Juraj in modern Croatian or Sut Juraj in the old dialect. The place gets a mention in the Hvar Communal Statute of 1331, as the old church of Sv Juraj, and the town coat of arms features St George slaying a dragon. The ferry fairly looms over the houses! The incoming ferry looked fairly small enough as as it approached, but seemed considerably larger once docked next to the houses! It was packed, even this early in the season, and what appeared to be a coachload of British tourists walked off in the direction of the main town. 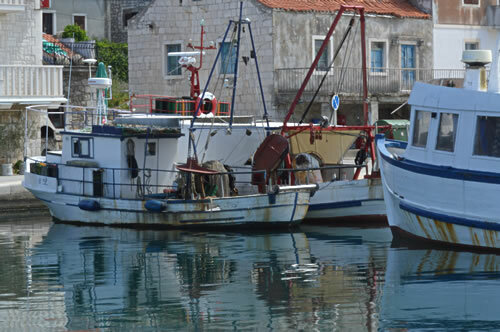 Following on, we found a very pretty little harbour, full of fishing boats. The line of tourists wound around the harbour and disappeared, while we sat down for coffee at a bar, and soaked in the atmosphere. The main industries here are fishing and tourism, and it’s all very low-key. I know also that Sućuraj has a very fine winery – Podrum Vujnović – which I very much want to visit one day. Now, I may need to stay over for that, as I seriously don’t want to drive back to Jelsa after a good wine tasting. Vujnović makes some excellent wines and ought to be enjoyed properly! 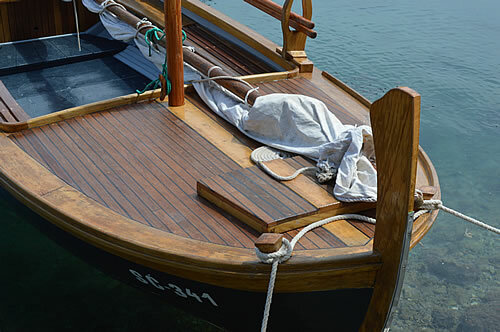 There are stylish touches everywhere – a beautifully polished old wooden boat with a lanteen sail, and immaculately coiled ropes. 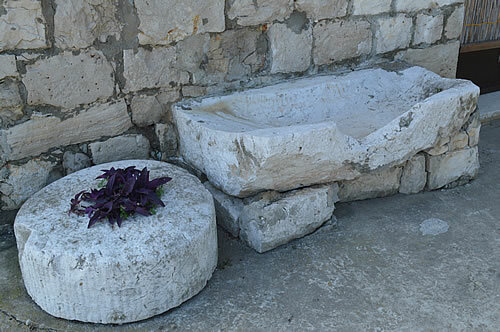 An old stone wheel for pressing olives now makes a flower planter, while an old olive tree root is a natural work of art. Apparently there’s a thriving artist community in Sućuraj, something else to explore one day, when we’re not just here to catch a ferry. Hey – who pulled the plug out? What a lovely little town – just about the same size as Vrboska – only Sućuraj is the administrative centre for the entire eastern part of the island. Much more than just a ferry terminal, we should always allow an extra hour to enjoy it! it’s so beautiful, I really want to visit! I hope I’ll be able to get there some day … maybe on my trip to Dubrovnik I can take a day trip / ferry to Hvar? Do you have any advice for this trip? I’m afraid that Hvar’s really not within a comfortable day trip from Dubrovnik. You’d need a speedboat or small plane I should think! There may be tours offered, I don’t know, but I’d guess that would be a very whirlwind visit. 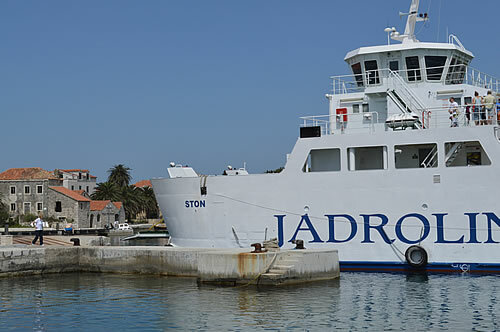 The coastal ferry runs twice a week in summer, and takes most of the day as it winds past Korcula, Mljet and the Penjasac peninsula. 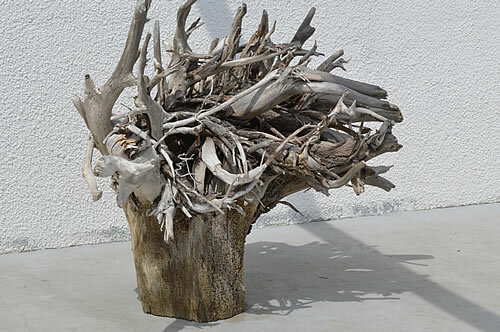 I plan to do that in September, as a nice relaxed way to see the coast and southern islands. Alternatively, you could drive up the Jadranska Magistrala, that most beautiful of coast roads, reaching Drvenik in about 4 hours and then catch the ferry over to Sucuraj on Hvar. However… Dubrovnik is also very beautiful and there’s lots to see and enjoy. You may be best to make Hvar a separate trip one day. It’s well worth a longer stay! Enjoy Dubrovnik! Beautiful photos. Particularly loved the one with the seagull. Thanks! At least I managed to get one photo before he flew off!